What Does It Mean to Register a Domain? - Ask Leo! A concept we often take for granted is that of internet domains. I'll look at what they are and how to purchase one and set it up. Domain registration is something many people take for granted. Yes, it means ownership of a sort, but it’s not enough to register a domain; if you actually want to use it for something, you’ll need to do more. First, we have to clarify exactly what this thing called a “domain” is. At its most basic, a domain is simply a human-readable name associated with a number — an IP address — that computers “really use” to talk to each other. There’s more, of course, but that’s the most basic concept. For example, “askleo.com” is a domain. “Askleo.com” is easier to remember and type than its current IP address, which is 67.227.211.203. I say “currently” because it could change. That’s another advantage of using domains over raw IP addresses: using the domain allows the IP address to change without consequence to you. While the common terminology is that you “purchase” a domain, in reality, it’s more like you’re leasing it. You retain ownership of a domain by paying an annual fee. Depending on the domain and the registrar, which I’ll talk about in a moment, those fees can be as low as five or six dollars a year, or much higher. Most registrars allow you to pre-pay at a discount for several years. A “registrar” is a company authorized to register domains on your behalf and sell them to you. For example, one of the largest domain registrars is GoDaddy. I happen to use SimpleURL. Not all registrars can sell all domains. For example, the popular “.com”, “.net” and “.org” domains are commonly available through most US-based registrars, but for foreign-based domains, such as “.co.uk”, “.cn”, “.to” and the like, you’ll often need to locate the registrar responsible for those “top level” domains, as they’re called, and register with them. By default, registration information is public. In other words, unless you take extra steps or specifically request an anonymization service from your registrar, your name, email address, and mailing address are all required to be public information. If you look at the registration information for askleo.com (scroll down once there) you’ll see the types of information made available. Make sure you understand what’s being made public and take appropriate steps to protect your privacy. In my case, I use a post office box and a voicemail-only telephone number. Once you’ve registered your domain, you don’t automatically get a working website or email. In fact, you often get absolutely nothing, except the ownership of the domain and the tools to allow you to make those IP address assignments. DNS, an acronym for “Domain Name System” (or Service), is the system used to map domain names to IP addresses and other information associated with the domain. The DNS server does not have to be owned or controlled by your registrar; the registrar simply needs to point to it when asked about your domain. Again, if you look at the information for “askleo.com”, even though it’s registered via SimpleURL, the DNS servers (also known as “Name Servers”) are a series of server names like “NS-26.AWSDNS-03.COM”. I have Amazon Web Services (AWS) handle my DNS. Most registrars automatically assign domains they register a DNS server of their own. In most cases, that’s just fine, and it may be required if you’re using some of the registrars’ additional services (I’ll get to them in a moment). The important thing is you have some kind of access to the DNS server’s information, so you can control the settings associated with your domain. DNS controls where email gets delivered for your domain. One of the bits of information DNS keeps about your domain is called an “MX”, or mail exchanger, record. MX says, “Email for this domain should be sent to that server over there.” It can, of course, point to a server you control, if you’re running your own email server. While that’s what I do, I suspect in most cases that’s not what you want. Many registrars offer email services as part of your domain purchase. Particularly if all you want the domain for is to have your own email address on that domain, those services are probably the way to go. The services include email forwarding — so you can, for example, set up email@yourveryowndomainname.com and have that automatically forwarded to your Outlook.com, Gmail, Yahoo!, or other email account. Even better, when you decide to switch email providers all you do is change the forwarding rule at your registrar, and email@yourveryowndomainname.com will automatically begin arriving at your new address — without having to tell all your contacts that anything has changed. Many registrars also provide actual email mailboxes for you to access your email directly, without forwarding it at all. Web hosting is all about setting up a website. It’s completely separate from email, with the exception that web hosting, too, starts in DNS. As I mentioned, one of the basic uses of DNS is to map the name to an IP address: “askleo.com” to 67.227.211.203, for example. What that means is that when you request a page from askleo.com in your browser — say by visiting https://askleo.com – your browser first asks DNS “where’s askleo.com?”, gets the answer (67.227.211.203), and then connects to the server at that IP address to fetch the pages that make up the site. That server is the “web host” — it’s the server that holds the files that make up the web site. None. If all you want is email, you may not need a web host at all. If all you care about is that email@yourveryowndomainname.com works, then it probably doesn’t matter that http://www.yourveryowndomainname.com doesn’t. Registrar provided. Letting your registrar host your website as well as your DNS is often the simplest approach to getting your website up. It’s not always the most cost-effective or capable, but it is simple, and often a great place to start. Shared hosting. With shared hosting, you contract with a provider to literally share some space on one of their servers, often with dozens or hundreds of other websites. They give you a place to put your content (and often host your email), and all you do is point your DNS at the IP address of their server. Shared hosting is extremely common and often inexpensive. For example, I often work with BlueHost, which at this writing offers a nice, complete package of web hosting for $6.95/month. There are many other services in this space; as I said, it’s extremely common. Dedicated hosting. For high-end or mission-critical services, dedicated hosting is pretty much what it sounds like: you contract with a hosting provider for an entire server (or virtual server) dedicated to whatever you want to do. While that’s how Ask Leo! is set up, I’d not recommend it for average consumers or small businesses unless you have extraordinary needs. It can be pricey and complex to administer. Host it yourself. I get questions about this all the time: people want to run a server at home. It’s very possible, but typically not practical, unless you’re quite knowledgeable and have a very good internet connection. Registering an available domain name itself. Using DNS to make sure the domain references the right servers and services. Determining if and what email services to use and how they should be provided. Determining if and what website services to use and how that should be set up. For casual use, a single domain registrar can typically provide the entire set of services to get your domain up and running. As your needs and experience expand, you can pick and choose, moving different aspects of domain management to other services and providers as needed. How do I Choose a Good Domain Name? - Registering your own domain is one way to keep an email address that you'll never need to change. 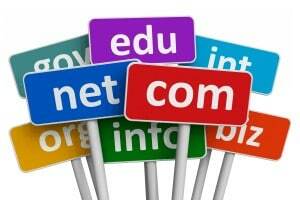 I'll look at some of the issues in choosing a domain name, and choosing a registrar. So just what is a “Server” anyway? - The term "server" is used a lot in many contexts, but it's really just a computer; quite often, it's one that isn't all that special. « Previous post: Can I Password Protect a Folder? I had a website with a realestate web co. and due to lack of income decided to drop the site as the charge of $45.00 was more than I got back. I asked if I could retain my Domain and was told they didn’t have it. If I wanted to retain it It would cost me $400.00 untill it was dropped. It got dropped and reasigned faster then I knew how to react. No more of these web site a–es for me! My email only (at this time) domain is registered with Gandi.Net who was one of the companies recommended by Fastmail.FM, my email service. I’ve been very satisfied with Gandi.Net, they seem to be very customer oriented compared to some of the domain horror stories I’ve heard. One tip, if you are considering purchasing a domain: many registrars (including GoDaddy) regularly offer coupons that can get you a discount at checkout time. Be sure and do a search for coupons offered by that particular registrar, before you purchase the domain. Years ago, way back in ’90 or ’91 when my then employer -a fair-sized company- was getting ‘on the internet’ they ‘applied’ through an internet connection provider for a set of permanent IP addresses (something like a dozen or so) and were asked what name or names they would like to give them – i.e. to suggest and get registered their own domain names (as I understand it). If you were a company like them, you might be able to get a .com or a .co.uk. You suggested a name to go in front of that and provided nobody else already had that name, you could use it once it had been ‘registered’ -who with, I didn’t know. This involved some paperwork, and took some time, but none of it seemed to cost anything – you didn’t pay anybody, because there wasn’t anybody to pay. Years passed and I didn’t follow how this kind of thing worked or how it changed. What happened to that? Now there seem to be thousands of companies managing and selling IP addresses and domain names. If IP addresses are unique (and surely they have to be), how come there isn’t just one place to go, and if you already have one or a range of IP addresses, why isn’t there some place (some DNS authority or something like that) where you can register what IP address you want ‘pointed at’ when the name is used? The companies we go to seem to be charging for something that doesn’t involve much, or any, work on their part, since it’s not actually they who make sure the IP addresses or domain names are unique, as I understand it. But somebody has to pay for the cost of running all those DNS name servers. Can you clarify? Mark /Leo , that’s just a slippery slope your traveling on.. I think of it as a Server that serves up domain names …. which is different to a server that serves eggs on toast. Not worth it. 🙂 Besides, part of the point here is that IP addresses DO change. When that happens this becomes a case in point. We are lucky to have our own names and surnames for free. This may change soon, though, and we will be left with a SSN as our sole identification. Would it be legal, however, to create a kind of membership having a free member registrar? Implementation is trivial – just put its DNS as primary and forget about yearly payments. Alternative solution would be just distributing ‘hosts’ file among members. At the end, this is a free internet, at least for now. This article clarifies some things for me. Thanks.